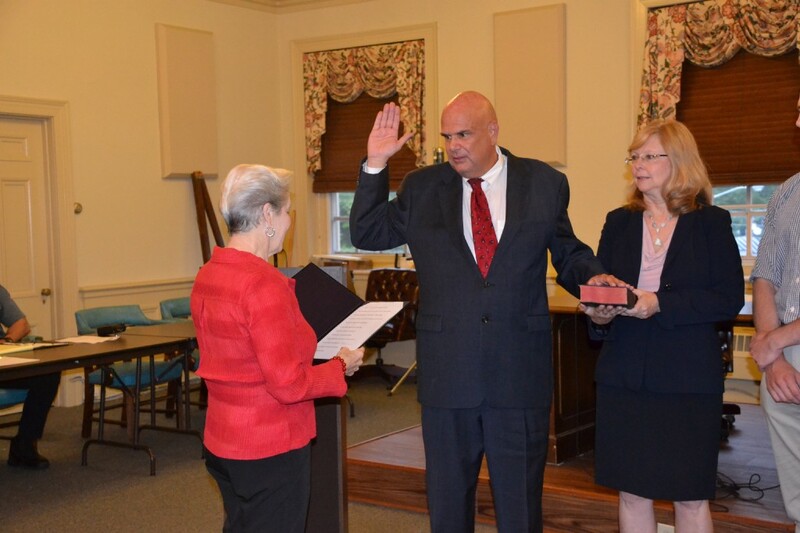 At the Tuesday, May 23 Board of Commissioners meeting, Neal Rochford was sworn in as mayor of Haddonfield. Commissioner Neal Rochford (center) was sworn in as mayor of Haddonfield by former Mayor Tish Colombi (left) at the Tuesday, May 23 Commissioner’s meeting. Rochford’s wife, Laura (right) held the bible he placed his hand on while his family gathered around him. At the Board of Commissioners meeting in Borough Hall on Tuesday, May 23, Neal Rochford was sworn in as mayor. Commissioners Jeffrey Kasko and John Moscatelli were also sworn in to their returning positions of director of finance and revenue and director of public works, parks and property, respectively. Rochford received the most votes in the borough’s May 9 election with 1,056 to Kasko’s 967 and Moscatelli’s 872. The trio will serve in office for a term of four years, which will expire in May 2021. Kasko will serve as the borough’s deputy mayor, and in the event of Rochford’s absence or incapacity, Kasko will perform the duties of mayor. Prior to Rochford’s swearing in, Kasko gave his final remarks as mayor of Haddonfield. He expressed his gratitude toward both the residents as well as his fellow commissioners for the opportunity to serve the town. “It has been a high honor for me and privilege to serve as commissioner and mayor of this town,” Kasko said. As a board, the commissioners have expressed a similarity in their priorities, Kasko said. From the redevelopment of the Bancroft site to roadway improvements and low tax rates, the same issues have ranked high on all of the commissioners’ concerns, and Kasko said he looks forward to continuing to work on these together over the next four years. Moscatelli also thanked the residents for re-electing him. “I’d like to thank the people of Haddonfield for their trust and support,” Moscatelli said. Following his swearing in, Rochford also praised his fellow commissioners who, he said, both excel in their roles. Rochford will return to his position director of public affairs and public safety. He said he looks forward to “another four years of accomplishments” in the area of public safety. Rochford expressed a desire to improve technology throughout the borough as well as tighten overdevelopment. “We need to make sure it’s done thoughtfully,” Rochford said. Rochford said despite political rancor at the national and state levels, he hopes local government can be a positive resource for the community. “We will work together on your behalf,” Rochford said to those in attendance. • The commissioners introduced an ordinance to combat overflowing litter receptacles. The ordinance prohibits bags of trash and litter in the borough’s trash cans. • An ordinance to amend Haddonfield’s codes on stormwater management was also introduced on first reading at Tuesday’s meeting. The ordinance requires all major developments that include installation of a stormwater system to have a maintenance plan in place. Moscatelli said the change is part of the borough’s continued efforts to combat stormwater flooding. “In recent years, both the planning and zoning boards realized we don’t have a mechanism in place to require that these systems be maintained,” Moscatelli said. The public hearing on both ordinances will be held at the next commissioners’ meeting on Tuesday, June 6 at 7:30 p.m.